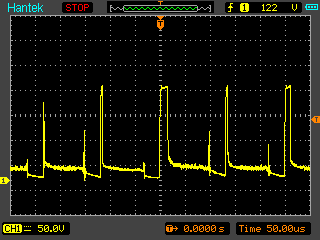 I decided to try out my new Hantek DS1060 and get some waveforms from the head of the EDM (Electrical Discharge Machine). The probe was hooked to the head of the machine and the ground was connected to the frame. I only took a few measurements but it may be interesting to some to see what the pulses look like when it’s cutting. This cut was burning at 75us on and 37us off. You can see that the voltage doesn’t drop to zero, and there seems to be a dropoff after the ionization path has started to cut the material. These dropoffs after the spike seems to indicate that the path is ionized and current control has kicked in, providing 8 amps. 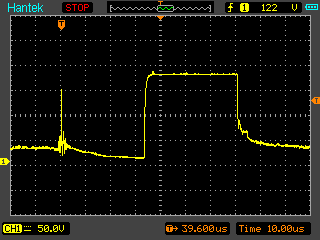 Once the time is up, the current shuts off and then there is a ringing spike, perhaps due to inductance. From there the voltage doesn’t reach zero but probably sits at a continuity testing voltage for a little under the 37us. From what I can tell, 75us is started from when the ionization path is established, and 37us is the time it cuts off the current, event though there is still voltage (and maybe a bit of capacitiance). The measurements seem to correlate to the settings a bit. The EDM itself is set for a 240V cutting voltage so the VMax of 181V is pretty close. 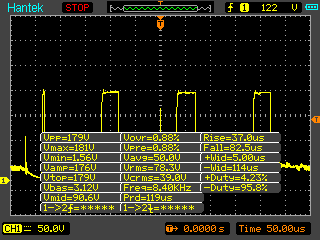 I think those values are a quite flexible, I know that before it cuts at all, the voltage is at approximately 240VDC. Anyways, I thought this would be interesting to post since some people are into EDM machines. I may take some waveforms from the wire EDM and two more different EDM’s. Here’s a final image of a zoomed in view of the peak.